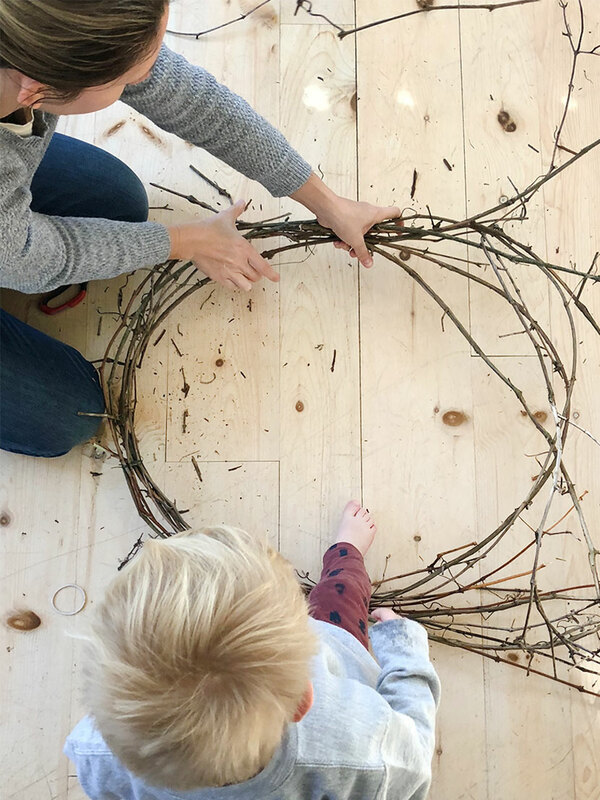 I love this time of the year because of all the different things we can make and create with what lies out our door. For years Christmas decor has been based on the natural and I am someone who bends to that idea. I love heading out with my favorite mittens and coat while Hayes plays. 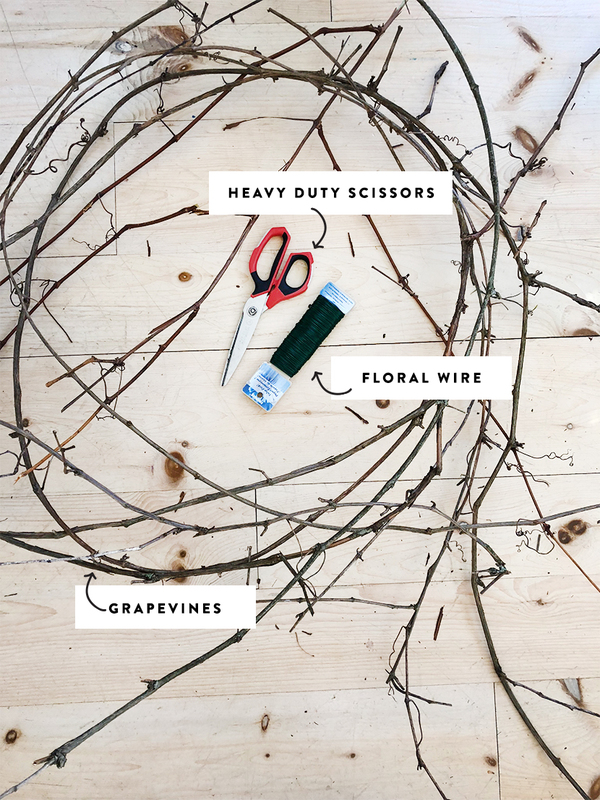 I take floral wire, shears, and a wagon to fill with greens and grapevines from the woods on our walks. I always find more than I ever need, but I love how inspired I am while my nose runs in the cold and Hayes tries to help me gather things. He is wonderful at finding berries and pinecones to bring home. 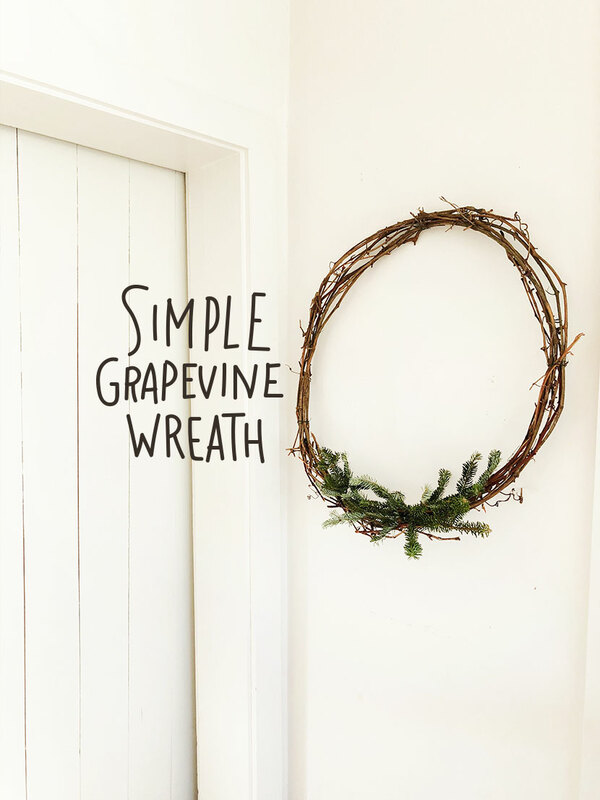 But hands down one of my favorite things to make are grapevine wreaths. I had spent so many years heading to Trader Joe’s or the local craft store to pick one up to decorate with. I realized when we moved back home that everything I needed to make my own grew in our yard. So last year I just one day gave it a go. The result was the chance to make a new wreath every season with whatever was out our front door or in our backyard. 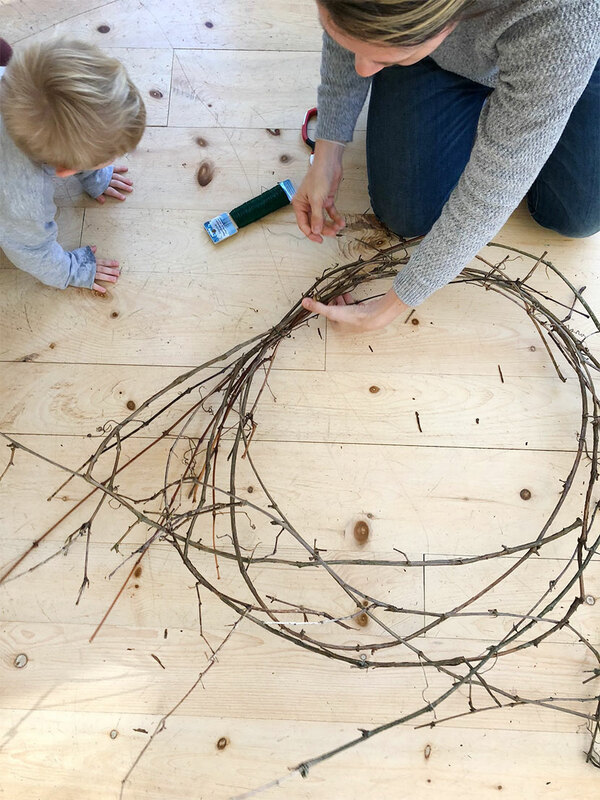 A great grapevine wreath lends as a wonderful form for any season you may want to make a wreath for so I thought I would share my tips for making your own today as I will be referencing this article quite a bit. So look forward to buying a few less wreath forms or saving any more coupons to craft stores. You have everything you need around you. To forage the grapevines you will need to live somewhere or know someone who has grapes. You want to find some that are still moist but maybe didn’t produce so you aren’t eliminating the chance of a crop the following year. Grapes need pruning anyways in order to continue their growth just make sure you don’t take too many from a healthy plant. You also don’t want them to be dead or else they will not shape well and break, which isn’t ideal. 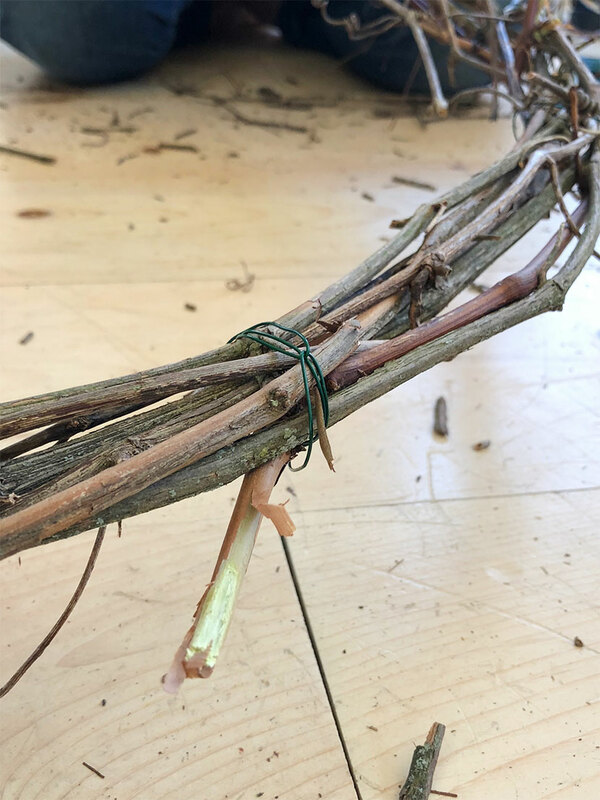 Finally, if you don’t have grapevines look for fallen twigs that are long and flexible. I have tossed some of those into my wreaths and as long as they aren’t dry they will bend into a wreath really well. 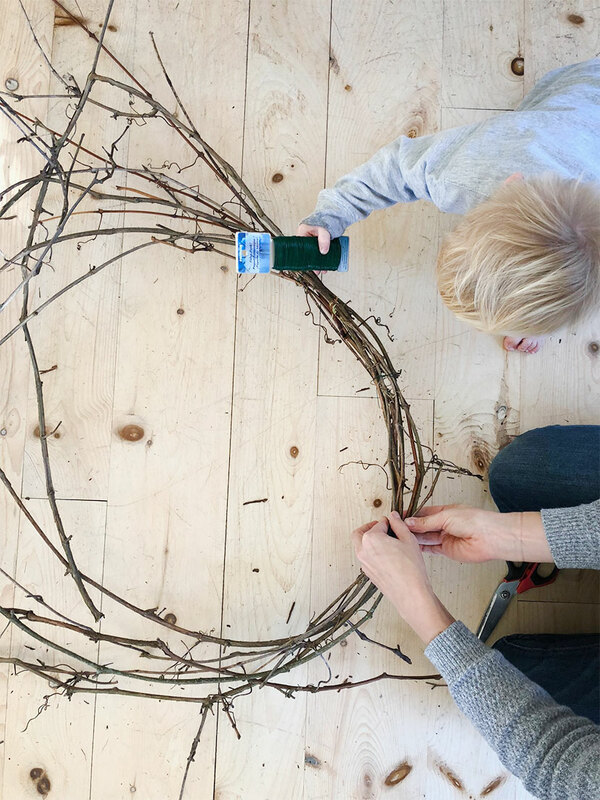 To make the wreath is so easy! Basically, it is a fun and creative game of taming the wilds of the vines. I love these types of things because it means every wreath will be different. I more or less allow the vines dictate the shape it will take. I look at what I have and see how it naturally falls so I am not fighting it more than necessary. 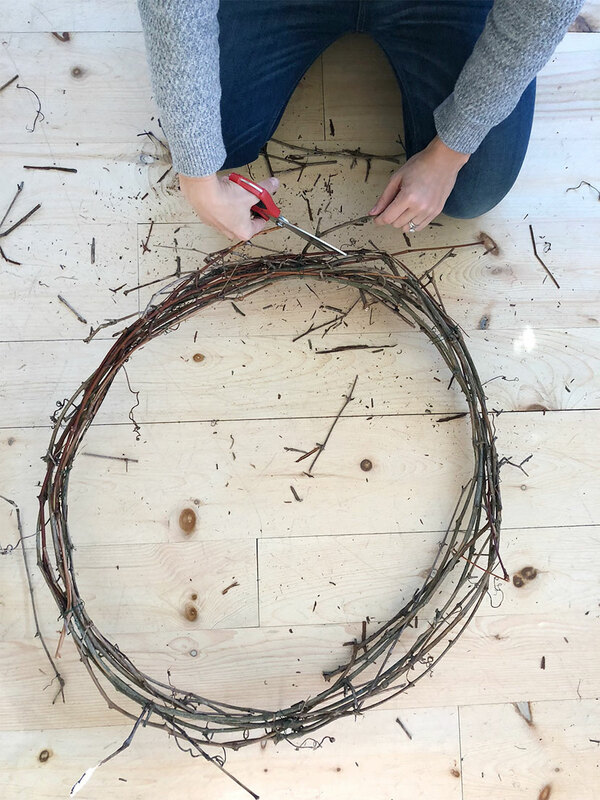 As I find clumps that go together, I cut off a good 10 inches of floral wire and wrap it tightly with the wire and lock it in so the vines don’t pull it open. I go around the whole thing till I get it all into a near circle shape. Sometimes I will need a break some vines down to bring them into the shape, but the more you can let them remain in one piece the better. Finally, at the very end I trim what needs trimming to make it as clean as desired. You can leave it wild or trim it down. I also find the more vines you have in your wreath the more places you have to stick greenery or dried floral. So the thicker it is the better. I had a hard time this year finding the proper amount of good vines so mine is a little thinner than I would like. 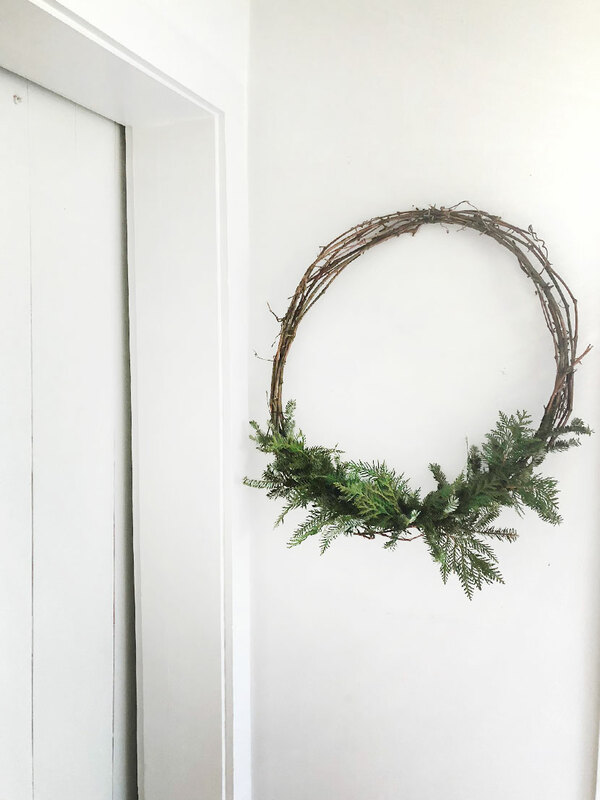 Finally, for the season you can gather cedar, pine, and fire branches to stick into the wreath and create your own wreath. You can see another wreath I did with a grapevine form here. This one was done with all Trader Joe’s branches, but obviously, you can forage as well and spend little to no money. So tell me how do you make your wreaths? Do you have a trick? I love this! 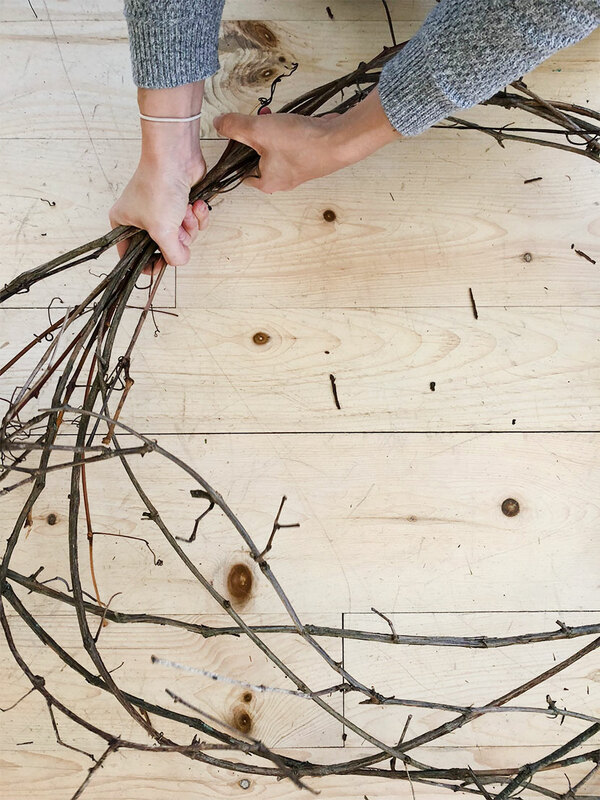 I want to forage to make my own wreath!! I’m so making this! I love the look of the grapevines and how everything is gathered from outdoors! I just tried my hand at thIs today. I have grapevines growing in my yard and never thought to use them! They tUrned out really grEat! I used fir trimmings and added some rosemary BRanches as well. Smells soooo good!